To help it do its job, wool needs just a little care. Leave your bed unmade for a good while each morning. This encourages moisture collected overnight to escape, keeping your bed dry and allergen-free. If you have a mattress topper, fold it over the foot of the bed once a month to let the mattress underneath have a chance to air-out. 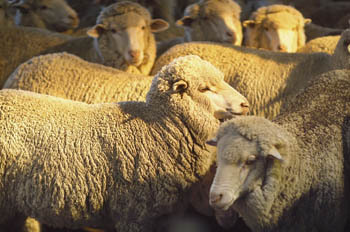 Wool with a lot of loft, like that in comforters and toppers, will compress somewhat over the first few weeks. Alternately rotate and flip a topper or comforter each time you wash your sheets to promote even wear and compression. Once a year, take all your wool outside on a sunny day. The sun will help deodorize, clean, disinfect and freshen the wool. If the item is washable, use a gentle wash cycle, and a gentle detergent. Do not dry clean. Vacuum all bedding regularly to remove dust. To spot clean, use a water, vinegar and soap solution. Two parts water, one part vinegar and one drop soap solution per pint. Blot, don’t rub stain. Ensure item is dry before using. Avoid wringing or twisting wet wool.